I used another World Machine (free version) terrain to start for this valley. I stacked the terrain and used some additional noise and erosion on both terrains in Bryce TE. I added some alien trees that I made in Hexagon and textured in Bryce (just like the terrains) and a tough lady posed in DAZ Studio. Hope everyone is having a good New Year - certainly some excellent Bryce images to kick it off. It’s also my 66th Birthday, yikes! Here’s a couple of images I did over the holidays. Another example of texture size reduction to get more content into Mac Bryce’s 2 gig memory limit. Features 1971s Bridge House model and clouds by Horo. An homage to “B” horror flicks where characters do very stupid things, usually with disastrous (often fatal) results. Architexture by Stonemason. Critter created in Modo. The characters, outfits and hair in both images are from DAZ3D. All the discussion of terrains on this forum led me to mess around with terrains created from the DTE which led to this image. Custom Bryce tree. Bot created in Modo. I am only a year younger than you. I noticed a long time ago that Bryce users are people who usually have grandchildren. :-) Young people do not really want to use Bryce, as there is no “make quick and beautiful” button there, and she (the young) wants everything at once. @slepalex : Totally agree! @Dan Whiteside : very nice work, I'm late but, happy birthday to you! Hansmar - nice valley. I really like the plants you made in Hexagon. 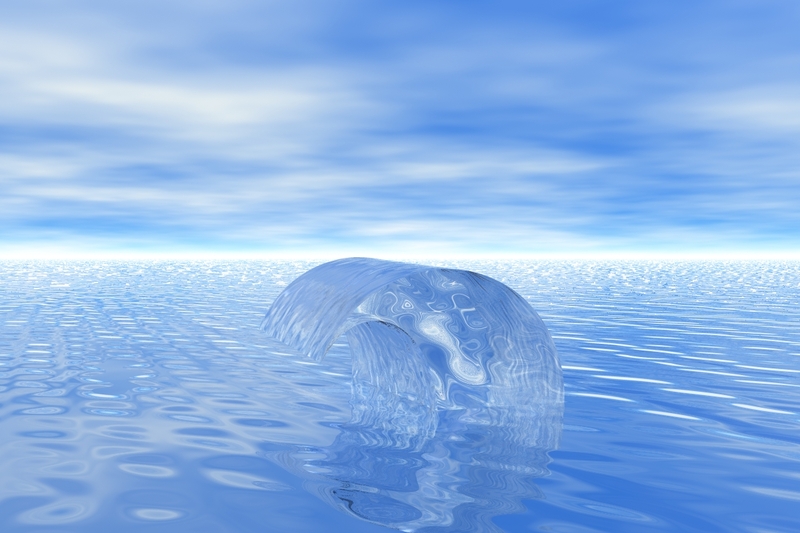 The idea was a glacier that ends at the water front of icy arctic water. Looking at the result, I'd say nice try, but I'm not fully convinced. 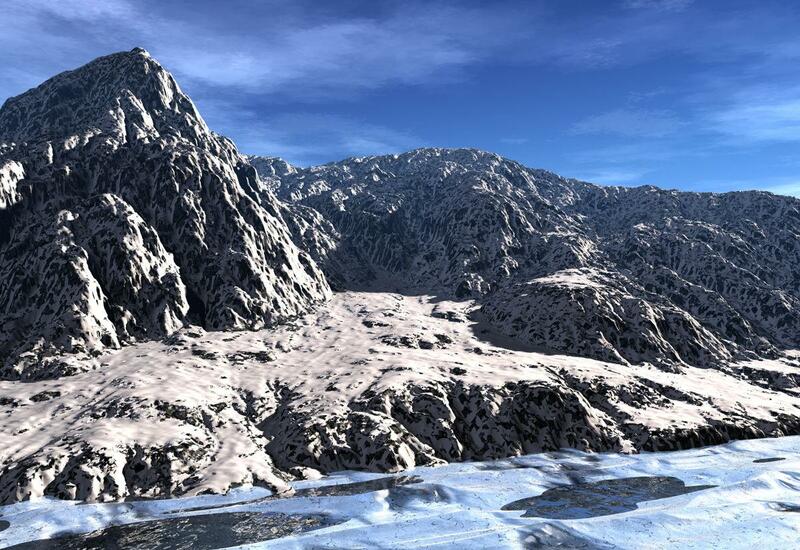 Hansmar - Real nice terrain using World Machine Basic; love the ridges and the open valley. Nice job making that plant as well. Horo - I love what you have started (FrozenShore); keep up the good work. Eugenius Maximus, grandchildren usually appear without asking permission from the grandfather. Horo, a good winter landscape except for the different colors of snow on the river and on the ground. Hansmar, turned out very well crumbling ground in the gorges. However, its color is not very consistent. Slepalex - thank you. The blue part should be ice, reflecting more of the sky than the white snow. Anyway, as I said, I'm not fully convinced. Hansmar : nice WM terrain, beautiful alien plants. Horo : frozen shore is a very good start. Just two world machine terrains textured in Bryce. Thanks so much for the Bithday wishes, tis certainly appreciated! Also thanks for the image comments - was really a lot of fun. Enjoying all the terrain images. adbc - thank you. Very nice landscape, looks like a path to hike on the right. 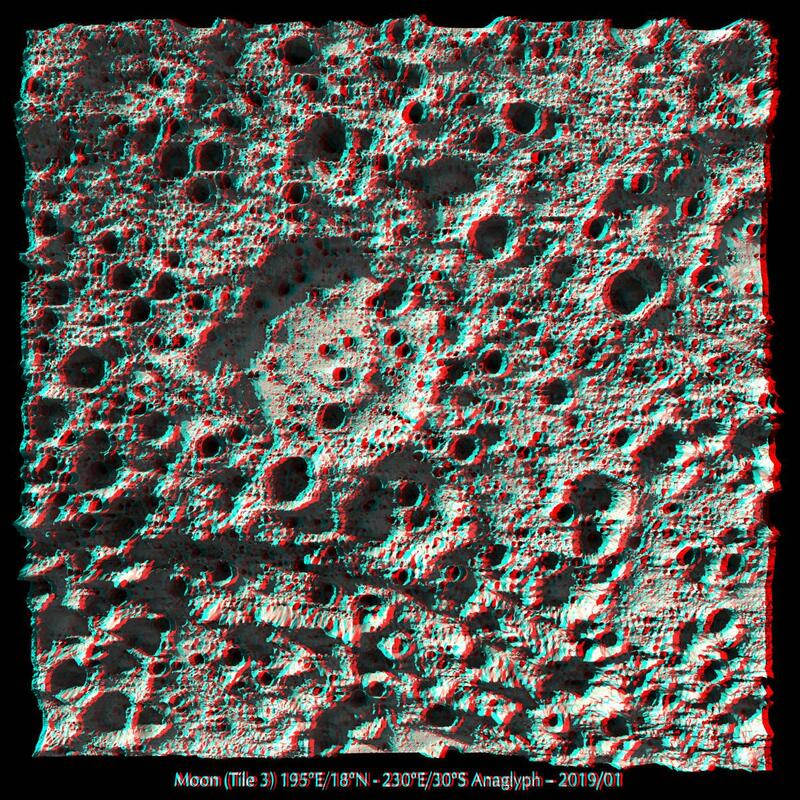 For the 3D enthusiasts a tile from the backside of the Moon extracted from the LDEM_128 (Lunar Digital Elevation Map) with the height strongly exaggerated and looking at it from above through the anaglyph lens system. Very nice, Horo...the overhead view works fine...to an extent. I suppose the lowered-viewed angle view (an oblique one) will always work best, as one has foreground relief blocking-out background releif - giving the possible 3D perspective more effect: sending distant terrain back, and terrain nearer closer to the camera. PS. Sorry for not commenting/contributing to the usual forum - stuck in a book for publication (but, I view daily the submissions - always a treat, a cheer-me-up). Horo - beautiful seascape, great tiled terrains, the Frozen Snow also came out nice, cool anaglyph. Electro-Elvis - very realistic scene, love the lighting and overall setup. Dan Whiteside - three great renders, Belated Congrats on your birthday. Horo, mermaid : thank you for your comment. Jamahoney - thank you Jay. You're right, of course, but it was an interesting experiment. Looking from west to east over the Korolev crater on the backside of the Moon (left to right in the overhead view above). The diameter is around 300 km (186 mi), the depiction makes it much smaller, the anaglyph below makes it even smaller. I'm not sure there is vegetation on the backside of the Moon but I'm certain there are fish in the pond. Horo, Thanks. I also like your glacier scene. But the colour difference between ice on the glacier and on the water is indeed too large, I think. The moon terrain (top view) should be made yellow, as Swiss cheese. The green moon is a wonderful terrain. Slepalex: Thanks. The colour difference is caused by the fact that it are stacked terrains and the darker green one pops through on some points. Adbc: Thank you, your world machine terrain is wonderful. That's lovely, Horo...I always felt terra-forming moon features great fun: I flooded some (YouTube Link + sound) several years back for the craic - all done in Bryce, of course. Today i was trying to do a wave... and i mean huge crashing wave, for surfer's joy and horror! At first i thought i should try the most simple and mininal depiction - using two cylinders. Of course i understood that such would only be suitable for cartoon / non-realistic render, so i switched to next attempts. I made BW pic from photo and imported into TE. As it was sideview, then i rotated it. I guess if terrains here could have heightmaps for both sides, i could do such curve differently, i don't know. I ended up with something like that. I think i had to add some ambient and increase transparency otherwise it was too dark. But most obvious problem (other than difference between wave and infinite water plane) was flat field of my landscape, which i didnt know how to make transparent. After some reading on Bryce, i tried transparency with alpha-channel (yeah, that's when i thought i deleted Leo 2D picture) throught blending mode (?) which... while gave results, i couldnt use it with actual water material (it will render infinetely) so on this picture i have some basic mat just to show how it looked at that point. It looked like something that can be used for clouds or hurricane, though, don't you think? After reading more on Bryce i found out that i didn't know about lattices! (i'm still pretty new to brycescape) So i converted terrain to lattice which solved my problem with transparency (before which i hoped i could find out how to change things in DTE in a way that lowest level of landscape would be transparent while highest is most solid - but i lack experience'n'knowledge for that manipulation, if its even possible), so i decided to give it a try. Well as you might agree, in the end, it looks better than i expected. 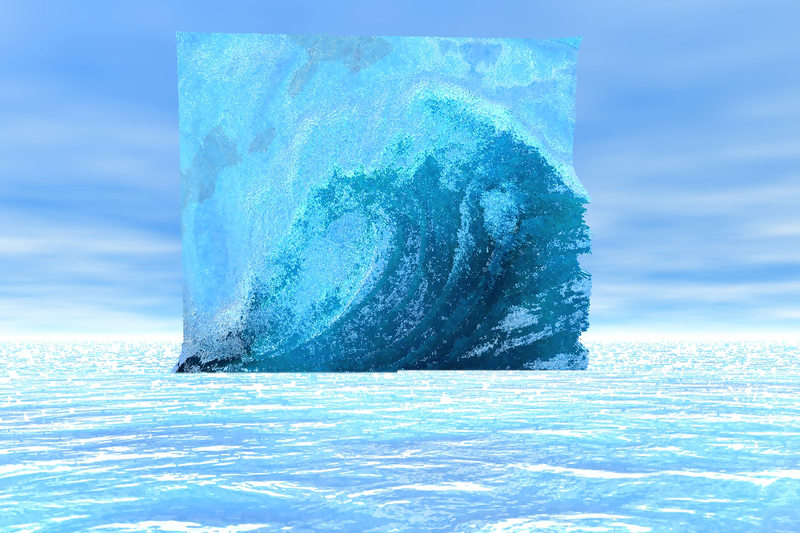 Many things are wrong of course - i've no idea how to blend it with water around so it won't look like iceberg from beneeath; it take several hours for preview render; my wave is trimmed so right side is just cutted away; lighter sides should end with foam or something; etc etc etc. But overall i thought it would be more ridiculous. And this is how terrain looks. Pretty messy and incorrect, yeah. My black and white pic for it's base was simple convert, so it only "works" for frontal view i'd say? 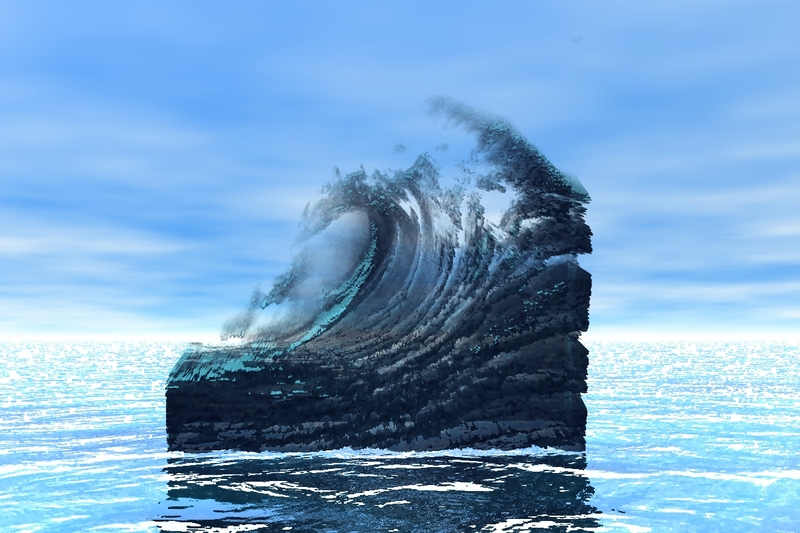 Because if i was to "truely" model wave, it would be much more 3-dimensional (left side would be something that is further away from us and right side is something which is closer). Would love to hear your thoughts on subject. 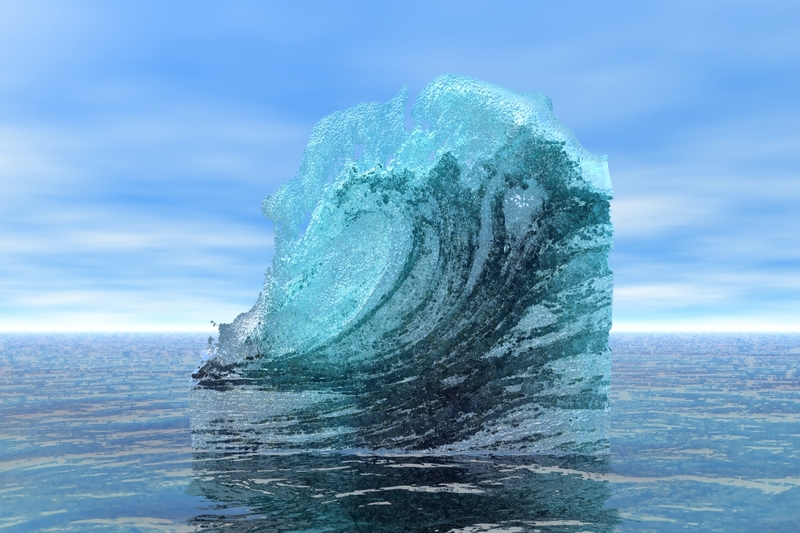 I know that usually people use software or plugins (especially in high-end apps) that do actual fluid simulation for stuff like this, but i thought "why not to play around". I also seen some .obj models of waves for bryce/vue for sale (i guess those were modelled through spline modelling or smth, or through classic polygonal modelling with bending surfaces, idk). 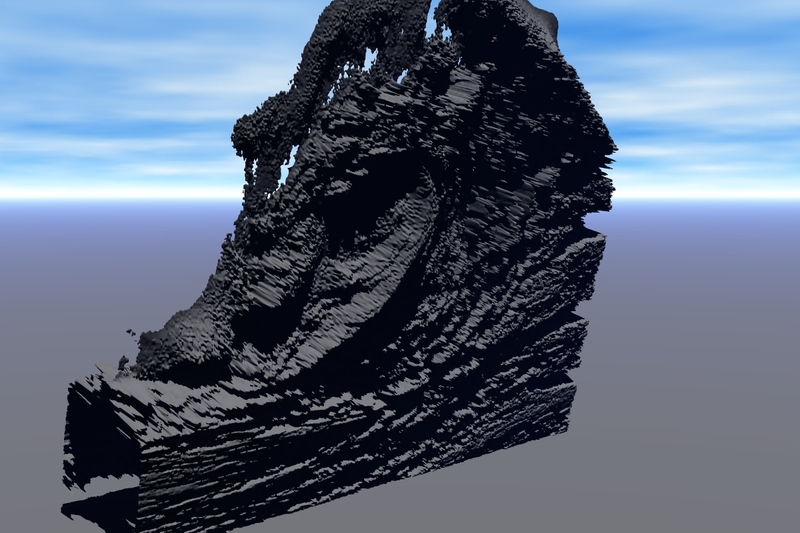 adbc - Nice combination of terrains and good job using World Machine. 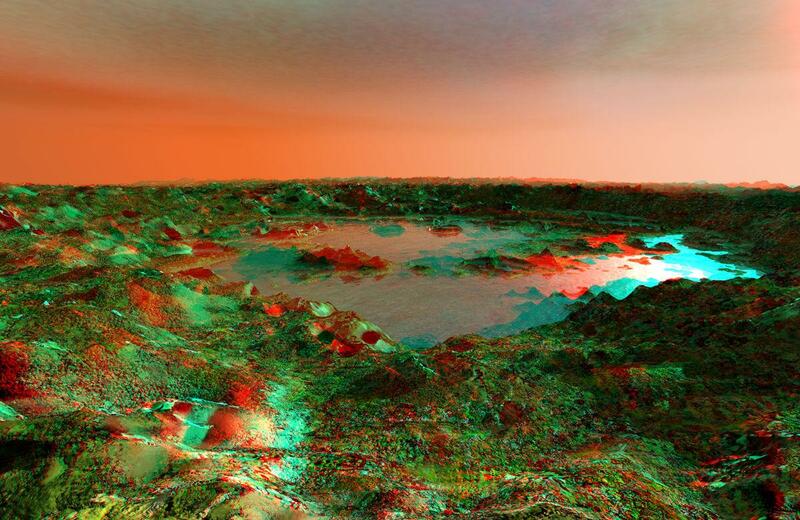 Horo - Awesome luna terrain and really cool anaglyph POV. Lake Korolev landscape is astonishing. akmerlow - Amazing wave Symmetrical Lattice and texturing. Jay - thank you. Super cool video. akmerlow - interesting experiments. I never tried such a single wave. #5 Black Rock (http://www.daz3d.com/forums/viewthread/37860/P45/) I made with terrains. Eugenius - thank you. I like your sand mountains, nicely lit, too. 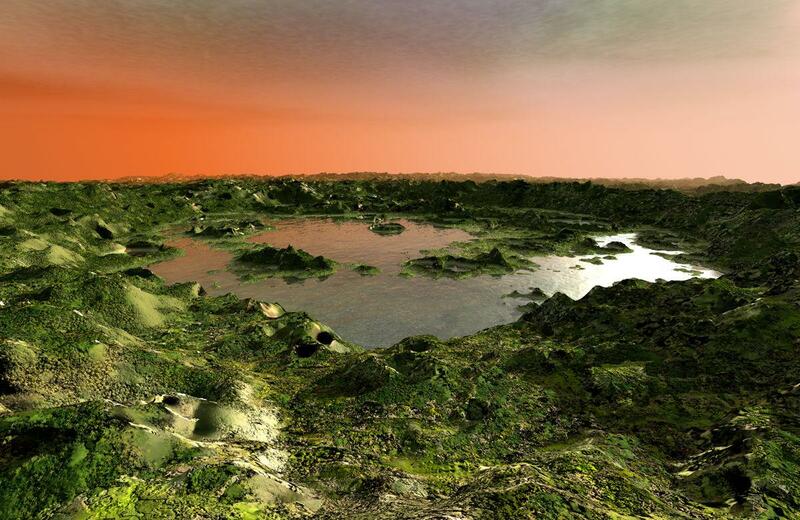 Horo : Amazing Lake Korolev landscape, beautiful texture on the terrain and great anagplyph. akmerlow : Nice experiment, tried several times with tutorials but gave up. Very difficult to get a satisfying result. Eugenius : Thank you. Sand Moutains is an outstanding image. Akmerlow: Interesting experiments. Keep working on it! Eugenius: Great sand-mountains. Its now snow: just very fine sand, I think. Akmerlow...great wave experiments, and I'd say if you positioned your model (or a few of them stuck together) in liu with a good camera angle, you'd have some very convincing waves. PS. I once tried to use the curved eye-lashes effect of a head model as waves...but I would have had to include hundreds of separate eyelashes. Horo - Thank you. World Creator's Isolines help a lot. adbc - Many thanks. If you haven't already, you should try GeoControl Demo (now known as World Creator). Eugenius Maximus, Horo, adbc, Hansmar, Jamahoney - thanks for kind words and thoughts. Will definitely return to this experiment in future. 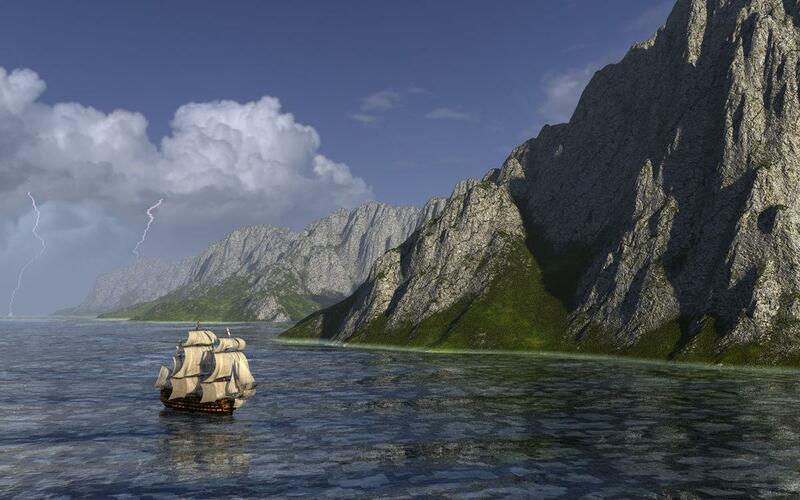 Nothing special, three terrains, a water terrain, HMS Victory from DAZ 3D and an HDRI. The lighntings were extracted from photos I made almost 2 years ago, prepared and put on 2D faces. Horo, epic scene of seaside voyage! Two times the same landscape from me. Made with a number of terrains (made in Bryce, no external tools used). One with a sunset HDRI I found somewhere in a set and no sun. The other one with sun and with a sky by David Brinnen. Bird and boat are freebies. Hansmar, lovely scenes! Especially i like the one with sunset. Such a warm, calm view! Dan Whiteside, congratulations with (both winter and your personal) holidays! B-movie horror humour is classic. Eugenius Maximus - beautiful land of sands. Pretty seductive for those, whose heart is open for discovery. Hello everyone, its been a long time since i have posted, i do still stop by to see what everyone is doing, Very cool and beautiful renders from everyone, still playing with Bryce a lot but i can never seem to finsih anything that i am happy with. Anyway, the sky in this render is one of Davids materials applied to a sphere and then enlarged to encompas the entire scene, the purple one. I made another version of my valey. Different texture, sky and pose of the figure, as well as different camera position.